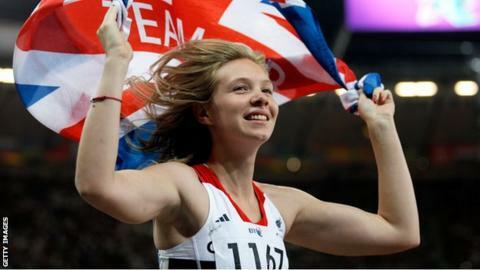 British teenager Bethany Woodward claimed her second medal of the London Paralympics with silver in the T37 200m. Woodward, 19, had already won bronze as part of the GB T35-38 4x100m relay team on Tuesday. She crossed the line in Wednesday's race in 29.65 seconds, behind Namibia's Johanna Benson. "I felt like I got everything that I could possibly do right in that race," said Woodward. She added: "My legs were sore because of doing three races in under 24 hours but I wasn't going to let any of that affect my performance." GB's David Devine followed up his 1500m bronze with the same result in the T12 800m. The visually impaired runner trailed Cuba's Lazaro Rashid by nearly 10m heading into the home straight but produced a stunning finish to sneak third in a photo finish. After a delay before the results were revealed on the large scoreboard in the Olympic Stadium the crowd erupted with the news that Devine had finished third in one minute 58.72 seconds - just six one-hundredths of a second ahead of Lazaro. The athlete himself admitted though he had to ask one of the race officials whether they were cheering for him. "When he told me, I was made up," said Devine. "I don't do enough speed work to expect to be so successful in the 800m and my legs felt so heavy. I couldn't get going at all, so I'm delighted to get a medal." "I think it's all about Jonnie Peacock on Thursday, he's significantly quicker [than Oscar Pistorius]. From what I've seen of Jonnie he has made a real change in his running style - with single leg amputees they don't always produce such an even style, but he looked even, was quick and it was very very good." Great Britain's 17-year-old Sally Brown finished sixth in the T46 100m final. Northern Ireland's only runner in the GB team is an arm amputee sprinter who was desperately disappointed to miss out on her favoured 200m final earlier in the week. Speaking to 5 live sports extra after the 100m final Brown said: "I had a bad start, but I have to be happy with how I have done. "I'll know what to expect in Rio so I'll definitely take a lot of experience from this." One of the highlights on day eight will be the men's T44 100m final where Great Britain's world record holder Jonnie Peacock will face defending champion Oscar Pistorius. The British sprinter who, unlike Pistorius, runs with just the one 'blade', qualified quickest for the final in a time of 11.08 and is in confident mood. "I expected a few of the guys to push me more to be honest. I didn't think I'd win by so much, so I'm happy," said Peacock. "My start could have been better, but I'll come back stronger tomorrow."